I had burnt up my last sander and was in a pinch to get another. So I had found this sander at a box store for $80.00. Dave, I also have this ROS. I have recommended it to anyone that ask, it is a great sander and very comfortable to use over those long sanding project. Good Luck with yours. I have this one too. I like it a lot. I was using an old crappy vibrating sander so I had to get used to how quickly this thing removes material. the bag or the dust, although I do have to put on my hearing protection. Thanks for the review. It reminded me I need to get me a RO sander. Wood Magazine gave this top reviews as well: cost, comfort and, fastest removal of material, which is what we all need. Thanks. Nice review. It’s a great sander—I’ve had it for about six months now. My experience with Milwaukee tools have been nothing but good. My first ROS and I love it too. With the vac hooked up its a dream to sand and keep the shop clean. Palm sander, 1/4 sheet sander both are wasting away – “nevermore” quoth he. Oh yeah there is one thing i missed. The hooks on the pad have adhered very well to 3 different manufactures sandpapers. I do believe you can replace the pad also. Mill tools are picked on for being behind the technology curve. But there is something said for old-school, its proven and it works! I had a post up in the forum a couple weeks ago wondering with ROS to go with, this one or the nearly identical Ridgid. 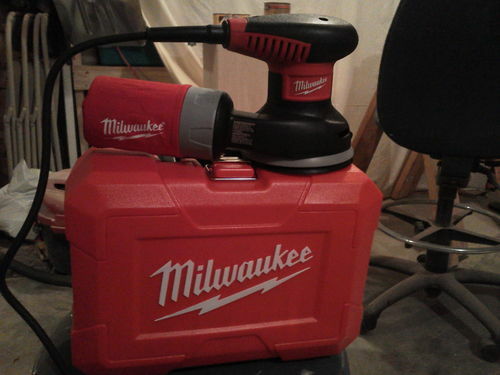 I went with this one in the end, becuase I too have had really good luck with Milwaukee power tools. Great sander so far, but I have not used it much yet. I had to replace the pad on mine—it was only 5 dollars at the local Milwaukee repair shop. I have the PC 392 and then bought the Milwaukee 6021-21. I changed the 6021-21 pad to a NH as paper is allot cheaper. I find that the Milwaukee is smoother and has less vibration so I use much more. It sands very flat on the wood and doesn’t wobble is the best way I can explain it and the PC does. It took a little while to become comfortable with the height difference but now that I am, I do not like to use the PC and only when I must. The price has dropped to about $60 or less so it is a real good buy. Anyone reading this, I would say try it you’ll like it. Also has a great warranty, 3 yrs I think. I have one and I’d give it 5 stars too. It’s the best out of 8 other brands I own. She’s still cooking. I just went from figured maple to basswood. And she has done a fine job. I hope that it is as good as everyone says! MY older PC needed new bearings, they quoted me at $54 (parts and labor before tax), I bought this one for just under $80 after taxes. I figured for another $25-ish I could get a 5 year warranty too which is worth the peace of mind to me. I posted this almost 800 days ago and mine is still cuttin dust. I sounds like it is a bit louder but is cooking right along.